Registration for MOCA members begins March 15, 2016. Registration for non-members begins April 30, 2016. Professional gravestone conservator Joe Ferrannini of Grave Stone Matters in Hoosick Falls, NY, offers a unique opportunity to learn about gravestone preservation and acquire essential conservation skills as well as practice through hands-on experience. MOCA urges workshop participants to donate generously as they are able to help cover workshop expenses of about $1,000 per day. Don’t hesitate to register based on your ability to donate, however. 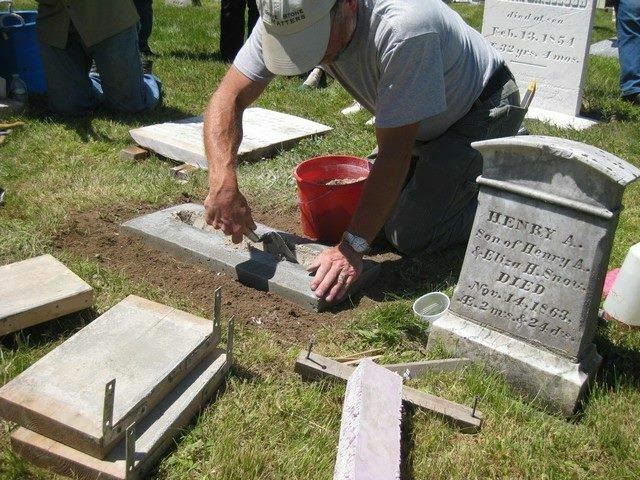 Our goal is to promote the use of correct materials and practices when working in cemeteries and to encourage workshop participants to share the skills they learn. Donations will be accepted each day of the workshop. Checks should be made payable to MOCA.